← Abramowitz and Stegun online! Happy birthday to Ray Harryhausen! It’s a good time of year for birthdays: today is Ray Harryhausen’s birthday! If you don’t know who Ray Harryhausen is, you should be ashamed of yourself — he’s the undisputed master of special effects. Harryhausen pioneered the use of stop-motion animation to bring fantastic creatures to life. If you’ve seen It Came From Beneath the Sea, The 7th Voyage of Sinbad, Jason and the Argonauts, The Golden Voyage of Sinbad, Clash of the Titans, The Beast From 20,000 Fathoms or — heaven help me — The Valley of Gwangi, you’ve seen Harryhausen’s mastery of special effects. 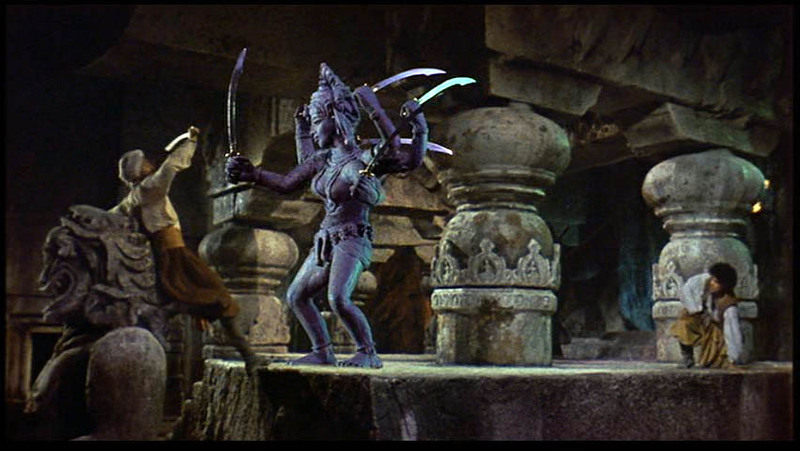 In order to rehearse all the six arms with the actors in the sequence three stunt men had to be strapped together with a big belt standing and posing as Kali. The adventure films of Harryhausen never made a whole lot of sense, but they were fun and filled with creatures more memorable than most of the throw-away CGI beasts produced today. Happy birthday, and hopefully many more, to the father of modern special effects! Update: The Seventh Voyage.com, a site dedicated to Harryhausen, is fascinating! Particularly intriguing is the section on Lost Projects, imaginative movie ideas that Harryhausen never got a chance to make. Even more intriguing: one of these lost projects, War Eagles, was originally conceived in 1940 but is going to be released in 2010, with Harryhausen as executive producer! From IMDB: “A publicly humiliated test pilot and a lost clan of vikings riding giant eagles are America’s only hope against a surprise Nazi attack.” Awesome! 2 Responses to Happy birthday to Ray Harryhausen! Oh, and happy birthday too, while I’m at it.